Please send me a price for the QP1111FP-43SQ new 43x43 plastic pallet. This 43x43 square pallet is universally recognized for exporting granular and chemical product to Asia in Super Sack® bulk bags. This square pallet is popular with feed, chemical and beverage industries because the square design helps resist load tipping. 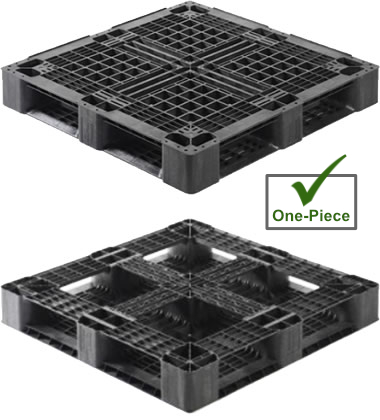 The cross-bottom cruciform base of the 6 runner QP1111FP-43SQ plastic pallet is a good match for block stacking. Plastic pallets like the QP1111FP-43SQ are lightweight and durable. Its uniform length and width provide ease of use and safety. Our fire retardant QP1111FP-43SQ plastic pallet option meets standards to be safer in areas where fire protection is a priority. Keep electronics safe from electrostatic discharge during shipping with anti-static options available on the QP1111FP-43SQ. Get more turns using the QP1111FP-43SQ multi-trip plastic pallet and easily win back startup costs with durable and reliable plastic. Use the QP1111FP-43SQ captive plastic pallet in closed loops to satisfy in-house reusability requirements with the reliability of plastic. Save costs when shipping cargo via air with the QP1111FP-43SQ air freight plastic pallet. Perfect for single use and one-way air shipment. Supporting 2,750 lbs of dynamic load when moved by a forklift or hand jack, this pallet works well in heavy duty applications. Is the QP1111FP-43SQ the right pallet for you?